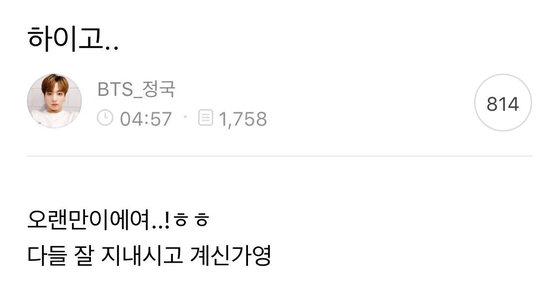 Last Thursday morning, BTS Jungkook came online and opened a chat room on the BTS official fan cafe. 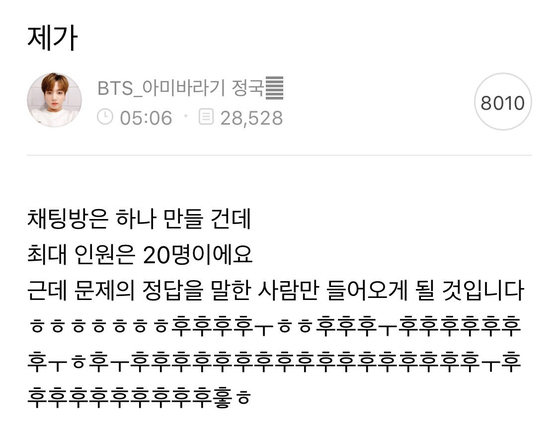 At almost five in the morning, on Thursday, December 6th, Jungkook uploaded a series of posts on the BTS official fan page and later started a chatroom open to a maximum of twenty people. Fifteen minutes afterwards, Jungkook opened another chat room that could fit up to one hundred people. Uploading a hint for the password, fans who guessed the password correctly were able to enter the chat rooms until the closing time. 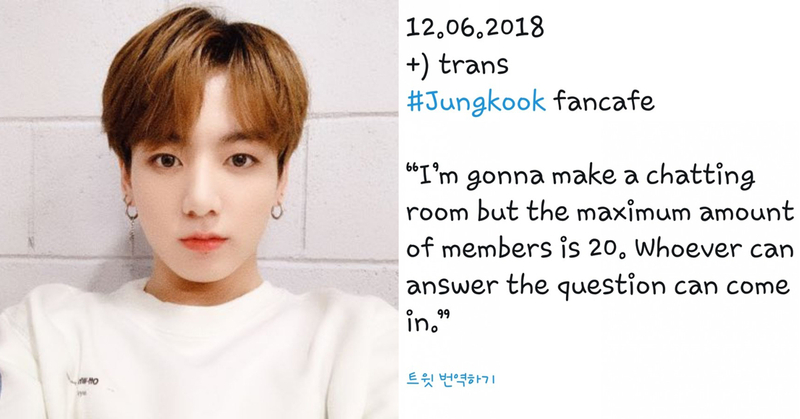 While fans who guessed the password correctly were able to communicate with Jungkook directly, fans who weren't so lucky were still able to witness the conversation afterwards through the fans who shared their conversation and experiences on the web in various online communities and social media. BTS Jungkook led a lively conversation with his fans, being almost uncharacteristically expressive and honest. Changing his username to 'ARMY-seeker' Jungkook changed his profile picture and asked his fans to change their profile pics to the one he just changed as well. He also asked for the participants' age, to which he later added "age is not important," and commenting "so cute lol" at another fan's response. "I should do this often," Jungkook remarked and the proceeded to talk about how he would go go about it, deciding to hold an open chat every Friday some time from late night to early the next morning at dawn. Jungkook didn't forget to express concern for his fans saying "Please don't be sick. Always stay healthy." 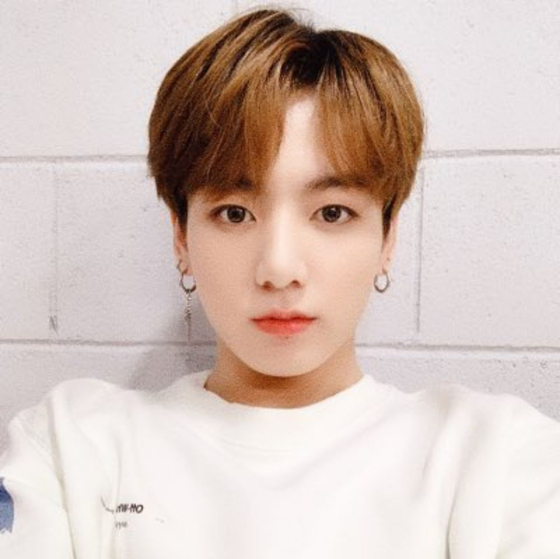 Screenshots of what Jungkook said and translations that followed have been going viral on the web as well as other comments such as "Talking to you guys, I feel like I'm not alone," which was received much warmly by numerous BTS and Jungkook fans. 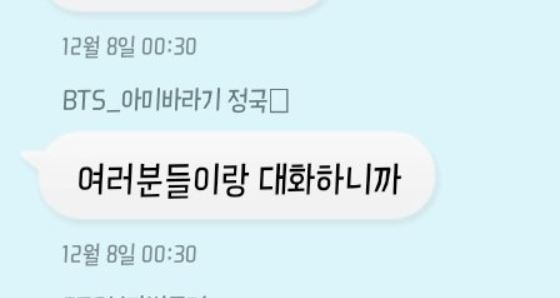 Fans who participated in the chat and fans afterwards who saw the postings commented "Jungkook is so lovely," "I can finally sleep well tonight after reading Jungkook's words." Whether Jungkook can truly be able to keep his promised meeting time each week in the midst of his busy schedule, we have yet to see.